to the company’s charter or bylaws and other shareholder litigation) against the company — and prohibiting such suits in other jurisdictions. Expected benefits cited by companies of adopting exclusive forum bylaw provisions include decreased litigation costs, avoiding parallel litigation in multiple jurisdictions and the predictability of Delaware courts. Shareowners generally oppose any exclusive forum provisions adopted by boards, unless put to a vote by shareowners. I did write a little about the movement toward exclusive forum provisions after Joe Grundfest urged companies to adopt them. See End to Forum Shopping and mocking nightmare post at after listening to Vice Chancellor Laster at a dinner event earlier this year. See also Coordinated Attack on Exclusive Forum at theCorporateCounsel.net and Shareholders Sue Over Exclusive Forum Bylaws. ethics, This promotion of the charismatic approach inevitably led to the development of a “superstar system,” where there’s “… a highly skewed distribution of income, market share, and public attention …” – Rosen (1981). Rosen was actually writing about the movie business, but it seems that this quote is a fair description of the rise of CEO’s of major corporations. Just as a superstar’s name can sell movies, appointing a “superstar CEO” can make the stock price rise rapidly (in the short term, at least). However, a charismatic, superstar CEO can also behave in ways which are antithetical to sound management (by imposing poor decisions) and good governance (by ignoring detail and compliance). And, where there is charismatic leadership, group members tend to view success in relation to their leaders’ opinion. Bennett series of articles has been raising important issues. They are especially important because he is a compensation consultant and they have been in the lead in creating many of the problematic structures, in the first place. Contrast with with Charles Elson’s recent study. We argue that: (I) theories of optimal market-based contracting are misguided in that they are predicated upon the chimerical notion of vigorous and competitive markets for transferable executive talent; (II) that even boards comprised of only the most faithful fiduciaries of shareholder interests will fail to reach an agreeable resolution to the compensation conundrum because of the unfounded reliance on the structurally malignant and unnecessary process of peer benchmarking; and, (III) that the solution lies in avoiding the mechanistic and arbitrary application of peer group data in arriving at executive compensation levels. Instead, independent and shareholder-conscious compensation committees must develop internally created standards of pay based on the individual nature of the organization concerned, its particular competitive environment and its internal dynamics. Can the SEC fine itself for facilitating differential market access – in effect encouraging insider trading? Perhaps it’s time for the SEC’s enforcement division to take a look inside the rabbit warren that is the SEC headquarters. Someone should point Robert Khuzami, the SEC’s head of enforcement, to the office of the Division of Trading and Markets. That division just approved allowing the New York Stock Exchange to profit by charging high frequency traders to “co-locate” their flash-crash causing computers at the NYSE’s data center. That, in turns, allows some investors to get price data before others. Great to see Lukomnik back to blogging. His posts are tell stories of insight and wit. Corporate governance practices are starting to change dramatically, in large part because of the pressure he and other investors have applied on companies, and because of the compelling business case that has been embraced by companies. But today, Smith is focused on a different type of governance issue: Getting companies to be more transparent about their political contributions and lobbying activities. Tim’s example, provided me with the inspiration to get involved 25-30 years ago. Let’s hope he continues to inspire at least another generation or two. In July of 1826, several prominent Wall Street firms abruptly went bankrupt, amid scandalous revelations of fraudulent financial practices by their management. Although mostly forgotten today, these events represented a watershed in the early development of the corporation laws and investor protections governing Wall Street: in the aftermath of the scandals, New York State enacted an extensive package of legislation designed to protect the interests of investors. These statutes were some of the the very first of their kind, and had a lasting influence. This paper analyzes the causes of the failures, and the evolution of the law in response. Almost 200 years later, scandal continues to by the main corporate governance driver. When will it be based on dreams and empirical research on the participatory salubrious institutions we actually want to create? Many more items follow. Great resource from Steve Quinlivan. It’s reassuring to see that credit union members can wake up and say no when their directors seem to be acting against members’ interests. The members of Technology Credit Union in San Jose (California) recently voted down their board’s proposal to convert the credit union to a mutual savings bank. Other co-op and credit union members losing their democratic systems of governance would do well to read Mark Latham’s paper We Want Our Co-ops Back and to implement a VoterMedia community program to reward coverage of governance activities so that members will be informed voters. On the eve of the Revolutionary War, wealth was distributed more evenly across the 13 colonies than anywhere else in the world that we have record of… The founding fathers evidently formed their ideas about democracy in a social context very different than our own, when distinctions of wealth simply weren’t as sharp. Wouldn’t it be great to get back a little closer to the original model when wealth in America was not only distributed more equally but we were, on average, richer than those in any other country? The earnings gap between rich and poor Americans was the widest in more than four decades in 2011, Census data show, surpassing income inequality previously reported in Uganda and Kazakhstan. The notion that each generation does better than the last — one aspect of the American Dream — has been challenged by evidence that average family incomes fell last decade for the first time since World War II. What made America great during several decades after WWII was that most of the productivity gains went to the middle class as income. Hedrick Smith’s Who Stole the American Dream? gathers some of the relevant research. From 1945 to the mid-1970s the productivity of American workers rose 96.8% and workers average pay rose 95%, almost identical. They were sharing in the nation’s gains and that increased consumer demand. From 1973 to 2011, the productivity rose 80% but average compensation rose only 10%…most of that in early years. In fact, the average male worker earned the same in 2011 as they did in 1978, adjusted for inflation. At the same time the pay of CEOs went from 40 times the average compensation to 360 times. 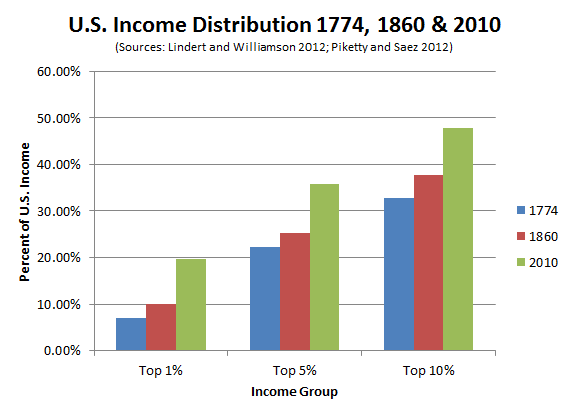 The income of the top 1% rose 6oo% over the same time. We are told the virtuous circle no longer works because the world is flat due to competition. We are told we need to give the wealth to the rich because they are the job creators. Don’t believe it. The job creators are the middle class consumers. Companies are sitting on $2 trillion of capital. The problem isn’t shortage of capital, it is shortage of demand. The world may be flat but Germany raised their wages five times faster than us. They have built a surplus while we went into deficit and they have twice as high a proportion of their population in manufacturing. How income gets divvied up does matter. As a long-term shareowner, I want more of the wealth going to workers so that we get out of this economic funk that is hurting us all.